Much like the art process, life is a unique form of creation inspired by evolving identity and expression. Like a painting, one brush stroke at a time, we formatively build upon our identity. Throughout a lifetime, our individual expressions evolve into a masterpiece of our truest selves. This is one of the reasons I find the arts incredibly beneficial for seniors of any age or background. With a bit of willingness to explore the creative process, my students often discover new outlets of expressive identity. Through my Arts & Wellness Program Inside Art, students have the opportunity to work with a variety of mediums in a supportive and expressive environment. Whether a student spent a lifetime in a creative field or far from it, the arts provide an enriching outlet bridging identity with expressive creativity. During classes, I focus specifically on the creative process and its development. After all, it is through the process we are able to attain a result. The art at the end of a class truly is a bonus of the creative journey. This teaching method allows flexibility in student engagement and can inspire creative conversations that often lead to further self-discovery and expression. No matter what age we are there is one human condition that remains constant throughout our lives, the need to relate with others and to express ourselves. 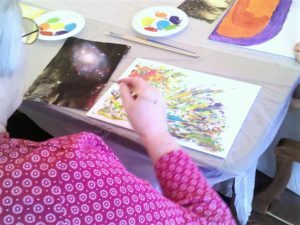 A group art class can be a great outlet for social engagement, expressive sharing. Group art can even inspire self-empowerment through capability. In a group environment individuals often share their creative efforts, tell stories and share memories relating to their artistic subjects. This sort of “identity sharing” creates a purposeful and supportive environment for self-expression. Group classes can be made suitable for any senior’s ability or life stage, and consequently can enhance benefits of their engagement. 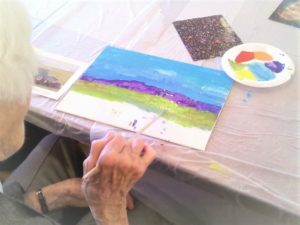 I have experienced seniors who are non-verbal paint the most colorful and expressive paintings. In such instances, the art speaks when the individual may not. This act of self-expression not only provides a sense of self-empowerment through ability, but also creates a sense of freedom for an individual who otherwise is quite dependent on others. In other cases, I have had students who were doctors their whole lives, suddenly find themselves engaging in the arts. Interestingly, in such cases where students have no creative background, the art may begin expressing subjective interests that even family may have never known. In such cases the art again becomes a communicative tool. This kind of creative sharing allows individuals to continue their journey of self-identity and expression, and is extremely self-validating as it provides continued growth and development. Art engagement for seniors can also be an activity that uplifts and promotes capability. As seniors age and experience different stages of their physicality, many have shared with me their frustrations along the way. Regardless of a student’s physical condition, I have found that art is often an outlet that many are still able to engage in considering a variety or art media and art methods. For example, I have witnessed firsthand a student’s vision slowly decline over the years. I empathetically listen and consider their concerns while encouraging creative methods sensitive to their condition. A student once shared with me their love of painting detailed landscapes for most of their life. But with progressive vision loss they cannot see details anymore. This student now paints landscapes inspired by impressionism. They use color and shape to create beautiful portrayals of landscape scenes. This connection of creative involvement allows this individual to find a sense of empowerment and flexibility in their physical condition. This kind of development may begin with engagement in the arts but can often carry over into daily life activities. Such an instance may spark an individual to question, “what else am I capable of? Or, what else can I still do but in a new way? Students who have complete vision loss can benefit from the use of clay to feel shape or form through completion. This engages the mind and one’s ability to problem solve, explore and imagine. It is also good exercise for fine motor skills and can be therapeutic for individuals with arthritis. In other cases, I have students who no longer have mobility and cannot hold a paint brush. These students still socially engage in the creative group environment. They can also be “decision makers” in the creation process. I may ask this student to tell me what color each shape should be and then color as directed. By the end of class they really have created an art piece. What was once colorless and plain is now colorful and unique. They made all the creative choices while I was simply following the student’s directions. The vibrant smile I often receive from this type of student experience, tells me the art did exactly what it was meant to do. With all students, I encourage individuals to make independent, creative decisions as this instills the building of confidence and trust within the self. A student benefits from rewards of self fulfillment when they are the leading role in their own creative process. Overall, just as our lives reflect our evolving development, the art of life is how we choose to express and share our identity. We are the sole connector to our soul and must engage in self appreciative activities to understand our ever changing needs. 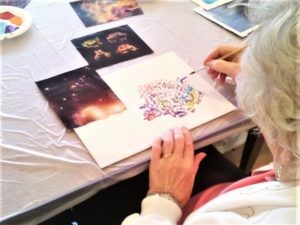 Seniors involved in a creative group can experience a deeper connection with a sense of continued identity and expression. These creative experiences can heighten an individual’s ability to be flexible and creative with whatever life stage they may find themselves in. Art is the culmination of a creative journey, but the journey truly is the art. 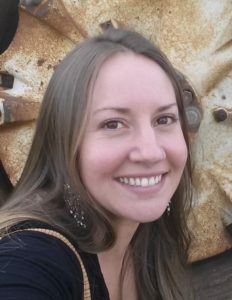 Tessa D’Agostino is the owner and operator of The Spiral Stone Of Cape Cod an Arts & Wellness Brand offering Nature and Spirituality Inspired Artwork, Therapeutic, Expressive and Studio Arts Classes, Life Coaching, Reiki and more.